The United States Marine Corps was established on November 10, 1775, to augment naval forces in the Revolutionary War. 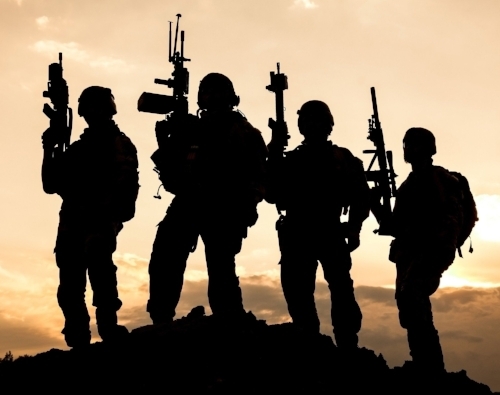 During the American Revolution, the Continental Congress passes a resolution stating that two Battalions of Marines be raised for service as landing forces for the recently formed Continental Navy. The resolution, drafted by future U.S. President John Adams and adopted in Philadelphia, created the Continental Marines and is now observed as the birth date of the United States Marine Corps. The recruiting headquarters was set up by Capt. Samuel Nicholas in the Tun Tavern on Water Street in Philadelphia, which is considered to be the birthplace of the Marines. As the first order of business, Samuel Nicholas became Commandant of the newly formed Marines. Tun Tavern's owner and popular patriot, Robert Mullan, became his first captain and recruiter. They began gathering support and were ready for action by early 1776 by raising 2 battalions. Just weeks after banding together, the Continental Marines successfully executed their first amphibious landing on a hostile shore. The British had been storing large supplies of gunpowder at Fort Nassau in the Bahamas for use in battle against the 13 colonies. Captain Samuel Nicholas and 234 Marines sailed with the Continental Navy on a mission to capture the supply. Within minutes of the Marines' arrival, the British troops had surrendered. In addition to the gunpowder, Captain Nicholas successfully acquired cannons and other military stores. The Marines first battle was won without firing a shot. After success in many campaigns, the Corps was abolished at the close of the Revolutionary War for reasons of economy. On July 11, 1798, Congress ordered the creation of the Corps, named it the United States Marine Corps and directed that it be available for service under the Secretary of the Navy. 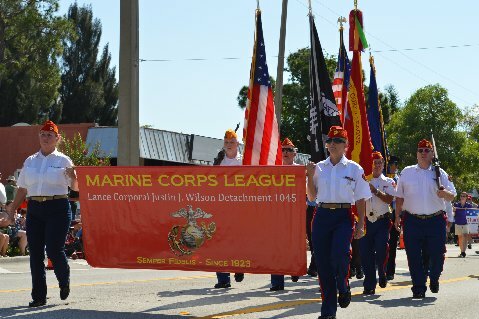 The Corps celebrated its birthday, or Marine Corps Day, on July 11 from 1799 until 1921 when the date was permanently changed to November 10 to commemorate the establishment of the Corps to aid in the Revolutionary War. The day is still observed by U. S. Marines worldwide. Special exhibits, parades, drill team performances, and speeches typically mark the occasion. The Birthday Ball, which culminates in the cutting of the birthday cake, is held that evening in Washington, D.C. It is not possible to determine precisely when the first cake ceremony was held, but the first on record took place at Marine Barracks, Washington, D.C., in 1937. Major General Thomas Holcomb, the Commandant, presided at an open house for Marine Corps officers, including the cutting of a huge cake in the shape of Tun Tavern. In 1922 Major Sidney W. Brewster, retired, had a vision in which appeared thousands of Marines who had seen service with the Corps, and as they marched before him in a monster parade, he conceived the idea of making his vision a reality. "Once a Marine, always!" was embodied in the thought of "Why not?" and from then until February 1923, the vision became an obsession until others with whom Brewster talked and conferred also became impressed and they, too, echoed "Why not?" From 1919 to 1923 veteran organizations sprang up in all parts of the country and in almost every section enthusiasm for such gatherings became a very vital factor in the community's life. The Marines were not behind in these matters and clubs, associations, and groups were formed in keeping with the prevalent feeling of comradeship, buddyism and good fellowship. They had served and fought together and now they met to recount the days of 1917, '18, and '19 spent in Parris Island, Quantico, France, and Germany. At length a gathering convened on November 10, 1922, by Brewster met together at the Hotel McAlpin in New York City to talk over the problem of making contacts and cementing relationships with other Marine Corps veteran organizations which had been formed in various parts of the country. Amongst others, First Lt. Paul Howard, retired; First Lt. James Duffy, retired; Second Lt. Frank D'Ipoli, Albert Lages, Milton Solomon, Roy Hagan, Frank Lambert, Miss Ray Sawyer, Mrs. Mae Garner, Webster de S. Smith, Merle McAlister, Rev. J. H. Clifford, and others were present. After lengthy discussion the Major's vision materialized and at this meeting he was elected temporary chairman and Miss Sawyer temporary secretary, and Raymond Wills, temporary treasurer. A committee was then appointed to lay plans for a national organization and the name of Marine Corps Veterans Association adopted. The titles of officers were then changed to Commandant, Adjutant, Paymaster, etc. The first national commandant, Major Brewster, was elected by acclamation, holding that position until the election of Major General John A. Lejeune at the second annual convention. The work of the association was a terrific task, but the National Adjutant, Miss Ray Sawyer, worked almost day and night during those early days to obtain a place for the new organization. The Marine Corps Veterans Association is known to have issued charters to three detachments prior to the "All-Marine Caucus" of June 1923. The McLemore Detachment, is the only remaining detachment of the Marine Corps Veterans Association, predating the Marine Corps League and has been in continuous operation since. The list of detachments are arranged in order of their first publication appearance in the Leatherneck Magazines. There is no organization or charter dates mentioned. The Marine Corps League was organized at the All-Marine Caucus held at the Hotel Pennsylvania, New York City, from June 3 to 6, 1923. It was the offspring of the Marine Corps Veterans Association headed by Major Sidney W. Brewster, who presided at the caucus. Marine Corps veterans from many states attended. Brigadier General John A. LeJeune, Commandant of the Marine Corps at the time, was unable to be present, but kept informed of the proceedings by telephone. Brigadier General James G. Harbord, U.S. Army, who commanded the Second Division, American Expeditionary Force (A.E.F. ), which included the Fifth Marine Regiment and Sixth Marine Regiment, addressed the closing session and was made an honorary member. At the end of the caucus, the Marine Corps Veterans Association would change its name after a bitter battle on the floor, to the Marine Corps League. Major General John A. Lejeune was unanimously elected to the position of National Commandant and Major Brewster became the first Past National Commandant. An amendment to the constitution was also passed at this convention, as follows: "All Past National Commandants shall be members of the Staff for life, with vote, and shall also be life delegates to the National Assembly with vote.